Switch to Rivertime, pack your warm clothes, grab the family and take advantage of having three days to explore the Riverland this June Long Weekend! Winter has just begun, spend some time on the river in a kayak, explore the hidden creeks or try a spot of fishing. 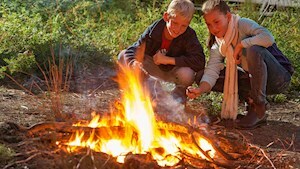 Relax by the campfire under the stars or check out some of the events happening in the region. Celebrate the Queens Birthday on the top deck of the Murray River Queen and check out the launch of their brand new rooftop bar and charcoal grill menu from "The Kings Table" with live entertainment by Trick Acoustic. Rug up in your flannies and ugg boots and enjoy red wine, rum and port by the fire at Caudo Vineyard or witness the famous ‘Running of The Sheep’ down the main street of Barmera at the SA Sheep Dog Trials. Also in the Barmera main street will be the Ute Muster, with a variety of utes from new to old to look at. Celebrate World Gin Day at 23rd Street Distillery with their inventive G&T’s, specialty cocktails, pizza’s and grazing platters or check out National artists along with the best South Australian talent at the SA Country Music Festival. Enjoy catering by Pete’s Wood Fired Pizza and live entertainment while sipping on the Woolshed Brewery’s range of beer, ciders and hard lemonade or check out what the local markets have to offer in Barmera, Berri and Waikerie. Visit the Cobdogla Steam Museum and see all the steam and working exhibits in operation, cruise on the historic PS Industry Paddle Steamer in Renmark or try out the great new additions to Locky’s Place American-style menu, kick back with a bevy & enjoy live acoustic tunes. Celebrate the Queens Birthday long weekend on the Top Deck of the Queen! The weather will have passed, and the sunshine will be out! This weekend is the launch of the new ROOFTOP BAR and the new Charcoal Grill menu from "The Kings Table." And to help the afternoon vibe along there will be live music from Trick Acoustic! 23rd Street Distillery are celebrating all things Gin in honour of World Gin Day! Enjoy speciality cocktails, inventive G&Ts, gourmet pizzas and grazing platters at the Riverland’s century-old distillery reignited with new creative passion. Entry is free. Set right on the bank of the Murray River, enjoy catering by Pete’s Wood Fired Pizza while sipping on the Woolshed Brewery’s range of beer, ciders and hard lemonade this Saturday 9th and Sunday 10th June. On the Sunday, also enjoy entertainment by The Steve Bartel Band. Wear your best flannelette shirts and ugg boots to drink plenty of red wine, rum and port by the camp fire at Caudo Vineyard. There will be live entertainment by “Off Ya Trio” from 12noon. The SA Country Music Festival has for the past 40 years remained the Biggest and the most Prestigious of its kind in the State. National artists along with the best South Australian talent will appear at some ninety shows over ten days in twenty venues and shows are held indoors or in heated marquees. The SA Country Music Concert will be at 7pm on Sat 10th June at the Cobdogla District Club - for Bookings please phone 8588 7092. The SA Sunday Spectacular will be held in the Barmera Monash Football Club and is another highlight with beautiful Lake Bonney as a backdrop to the day long show. Starting with the famous ‘Running of The Sheep’ down the main street in Barmera on Saturday the 10th June at 10:30am, The Sheep Dog Trials will then start at 12.30pm on the Barmera Monash Football Oval overlooking beautiful Lake Bonney. The trials continue Sunday and Monday with Sky Divers dropping in Sunday at 12 noon. Check out the talent headed to Locky’s Place this June long weekend! Paul Michael will be performing on Saturday from 7:30pm and Georgette Berry on Sunday from 1pm. Try out the great new additions to their American-style menu while you’re there, kick back with a bevy & enjoy! Come & Visit the Cobdogla Steam Museum and see all the steam and working exhibits in operation.Exhibits show the development of the Irrigation areas of the Riverland, settlers history and the WW2 Loveday Internment Camp. The Museum also houses the unique engineering example of a working Humphrey Pump ( currently awaiting recommissioning) the only one in the Southern Hemisphere. Experience a bygone era with a scenic cruise on the historic PS Industry! Hear the unique sounds of the paddle wheels, the hiss of steam and see the wood fire boiler being stoked as you take in the sights of the Renmark Riverfront area, majestic river red gums and cliff areas upstream of the town area. A delicious Devonshire Tea, with scones cooked in the wood fired oven, and topped with jam and cream are served for your enjoyment. Bookings are recommended - Please contact the Renmark Paringa Visitor Centre. The Ute Muster is a display of a variety of utes from new to old, street or farm, clean or dirty, and will be held in the main street in Barmera,down the bottom of the street near the Hotel. There are 12 different categories for the main part of the muster and 7 different novelty categories. The main categories include best Holden, Ford or other, best 4x4, best country ute, best street ute, best BNS ute, best feral ute, best Classic ute, best trade ute best custom ute and best chic's ute. The novelties include; most stickers, cleanest ute, dirtiest ute, most working ariels, most lights, best sound system and driver most suited to ute. There is also a best dressed cowboy or cowgirl section, must be under 12 yrs. Entry fees apply to all categories but free to come and have a look. Rosenthal Holden will have a 'Colorado' there for display.